It is Normandy, July 28, 1944. Outside Caen, the Americans have broken through the German defenses. Six stalemated British divisions redeploy to join the American attack. 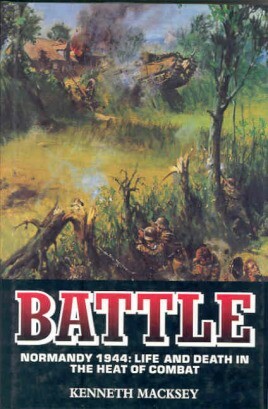 The ensuing battle involves infantry, tanks and artillery working together. The battle plans, which had seemed clear-cut and achievable during the battle seem a nightmarish botch to the frightened men who are fighting. Some men fail - as human beings, as leaders, as comrades; some just do their duty, some excel. It is a battle like any other, where the resources of men are tested to the limit and each is faced with his own stark moment of self-revelation. And here is the key. In order to show the reader the true nature of combat, Ken Macksey has selected a real engagement in which he took part, and has related authentic incidents played out by participants who have remained fictitious to protect the memory of the living and dead. He weaves a terrific story using all his experience and the result, part fact, part fiction is a unique and brilliant insight into what really happens in the life and death of warfare.